Provide comfort for the family of William Andrew Johnston with a meaningful gesture of sympathy. William Andrew Johnston also known by family and friends as Andy, passed away on Wednesday, December 19, 2018 at his home at the age of fifty-five. He was born on March 21, 1963 in Bonne Terre, Missouri, a son to the late Howard Johnston and the late Maggie (Black) Johnston. Andy is survived by his wife, Karen Johnston; five children: Jessica (Kenny) Spivey, Brandi Johnston and JD Gammon, Kayla (Kody) Barlow, Kayla (Dan) Warden, Nicholas Dunn; eleven grandchildren: Kaitlin, Kylie, Kaden, Skylar, Emma, Skyler, Lane, Dalton, Trenton, Chesney and Devon; one brother, Jeffrey (Tina) Johnston; one sister, Melanie Wills; brothers-in-law and sisters-in-law: Roy and Jackie Adams, Scott and Katie Hinkle; also surviving are nieces and nephews. Andy was preceded in death by his father and mother. The family will receive friends on Saturday, December 22, 2018 from 5:00 p.m. to 8:00 p.m. at the DeClue Funeral Home. Visitation will resume on Sunday, December 23, 2018 from 12:00 p.m. till 2:00 p.m.
A Funeral Service will be held on Sunday, December 23, 2018 at 2:00 p.m. at the DeClue Funeral Home with Pastor Randy Black officiating. Interment will be held at Hopewell Cemetery. 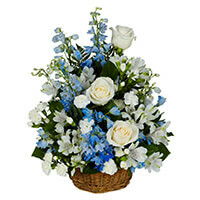 To send flowers in memory of William Andrew "Andy" Johnston, please visit our Heartfelt Sympathies Store. We encourage you to share your most beloved memories of William Andrew here, so that the family and other loved ones can always see it. You can upload cherished photographs, or share your favorite stories, and can even comment on those shared by others. Gehrs Family sent flowers to the family of William Andrew "Andy" Johnston. Karen and family - I'm so very sorry for your loss. My deepest condolences and prayers for peace and comfort. Gehrs Family purchased the PEACEFUL WISHES BASKET for the family of William Andrew Johnston.